Glock handguns have forever been favorites of law enforcement officials around the world. It isn’t often that one finds guns so specifically well designed. That’s why I figured I’d show you a complete rundown of the situation. We’re going to pick four of the signature Glock pistols available today and detail all those nice features that make a Glock a Glock! The beauty of the Gluck handgun stems from the fact that it was designed to be used in just about any situation in which you may need a gun. For instance, the trusty Glock 17 Gen 4 can be used for anything from police and military work to personal defense and sport shooting. It can easily be used by both experienced gun enthusiasts and first-time buyers. Although this one isn’t recommended for use by women or for hunting, there are many other models who fit both cases. For this small list, we’ve chosen the Glock 19 Gen 4, the Glock 20 Gen 4, the Glock 22 Gen 4, and the Glock 36 Gen 4. Don’t worry, other Glock handguns, as well as a couple of Gen 3 models, will be reviewed in separate articles. So we’ll, of course, be giving the Glock more than enough attention. PISTOL WEIGHT (Unloaded) WEIGHT (Loaded) TRIGGER TRAVEL TRIGGER PULL MAG CAP. A simple and reliable handgun. 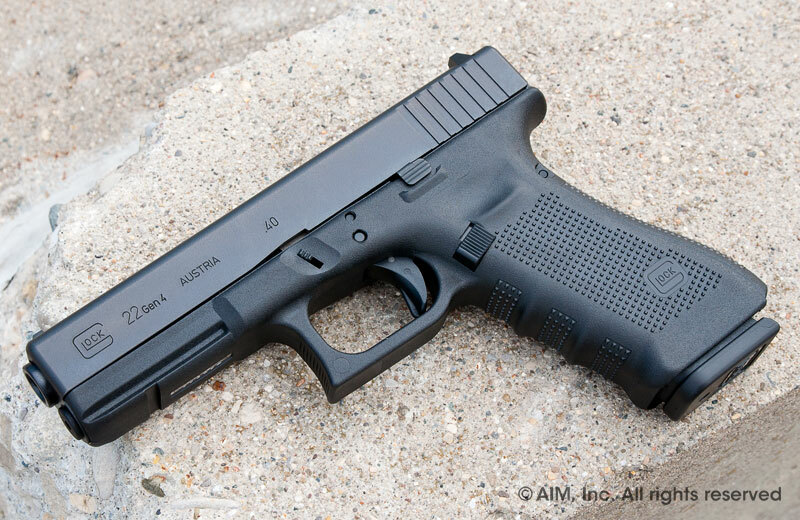 The Glock 19 Gen 4 is slightly superior to previous generation models on account of its lighter nature. That’s why, unlike with previous Glock 19 Gen 3 or even the Glock 17 Gen 3 (and 4), this one was built to be easily handled by both men and women. But while they did think of women when designing it, they apparently did not think of lefties. Glock is notorious for making its guns exclusively for right-handed users. While the gun can, of course, be used by lefties as well, it has its safety on the wrong side when you try to hold it. 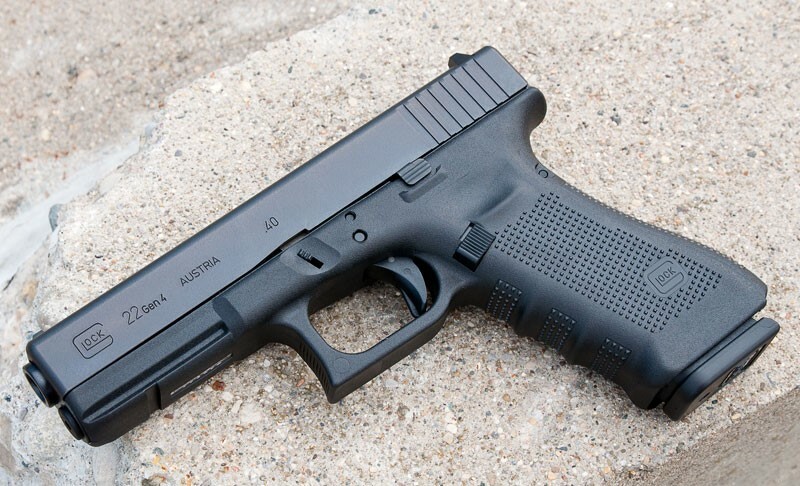 The Glock 19 Gen 4 features a customizable grip that can be adjusted according to each individual shooter’s hand. This can be done by using the Modular Back Strap. Another thing that is different with Gen 4 Glock handguns is the texture of the frame. It seems that the people behind these beautiful pistols finally realized that the Glock is not something you keep behind a screen. This is a real world, wear-and-tear weapon, designed to withstand daily use under extremely demanding conditions. That’s why the new texture that appears on Gen 4 Glock handguns is designed for greater resistance. 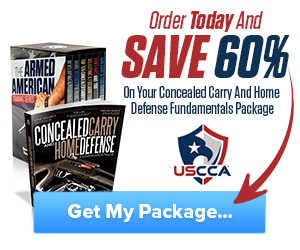 Recommended for: law enforcement, military, home defense, use by women. Not recommended for: sport shooting, hunting. 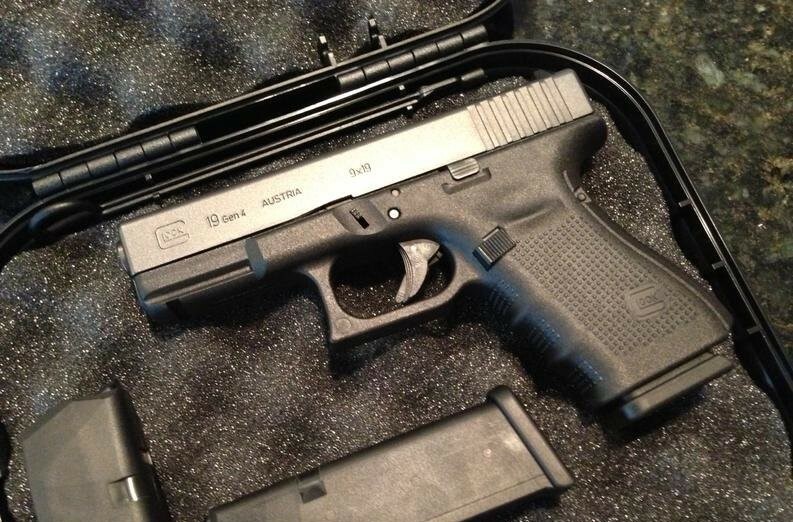 With the Glock 22 Gen 4 we move away from the realm of the Glock 9mm models and into the 40 cal Glock models. Compared to the Glock 19, this one is far more popular, even though you’d think the 9mm is the one with more fame to its name. Let’s say you’re speeding down the highway and a policeman pulls you over. Do you know what kind of gun he’s carrying? Well, of course, it’s the Glock 22 Gen 4. If you’re at a football game, you often see a few policemen standing by for security purposes. Do you know what guns they’re holding in their holsters? Of course, it’s the Glock 22 Gen 4. The point is that up to 90% of law enforcement officials in the US are using the Glock 22 Gen 4. The reliability of this pistol is simply unmatched. Glock handguns generally are good, but this one just goes over the top. A bit heavier than both the Glock 19 Gen 4 and even the Glock 17 Gen 3 (speaking of which, here’s a detailed review of this all-time classic). Just like the Glock 19 Gen 4, however, this one too has the dual recoil spring system and the Modular Back Strap system. 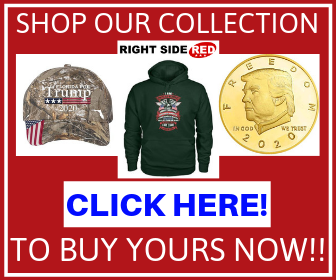 Recommended for: law enforcement, military, home defense, sport shooting. Not recommended for: hunting, use by women. Is this next gen or is it a downgrade. Well, to be honest, neither. 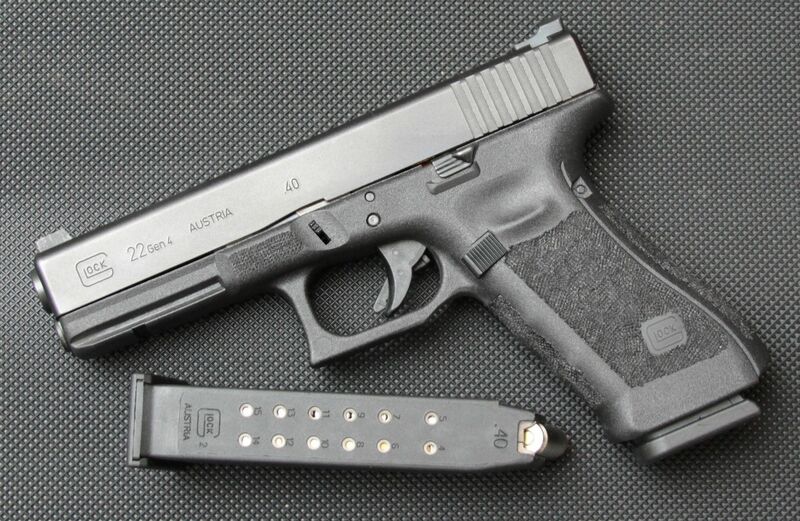 With the Glock 34 Gen 4, we’re getting back to 9mm Glock handguns. 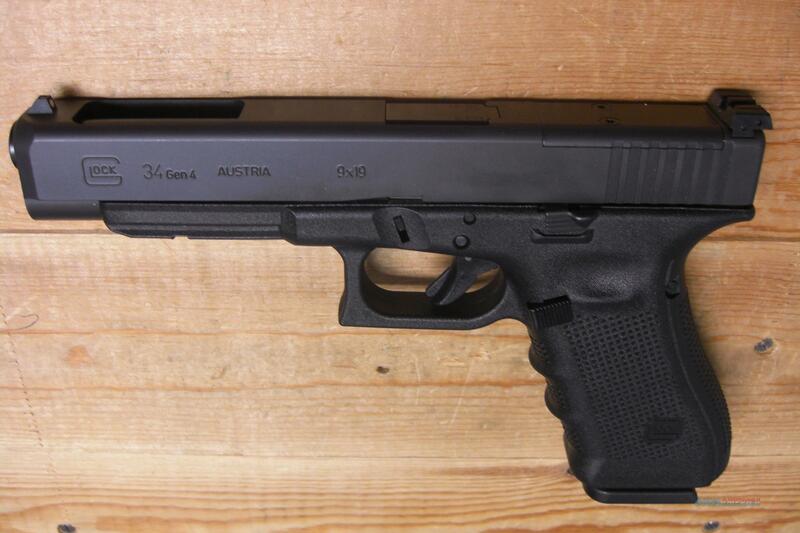 However, the Glock 34 Gen 4 is specifically designed for competition purposes. Therefore, it’s a gun to be used specifically by experienced gun enthusiasts in sport shooting and backyard ranges. Not used in law enforcement at all, this gun has not had the shot at fame so clearly marked as models like the Glock 19 Gen 4, the Glock 17 Gen 3, or the Glock 23 gen 3. But the Glock 34 Gen 4 has something very precious attached to its name: prestige. The slightly larger magazine capacity make it illegal to own without a permit while enabling professional shooters to fire more rounds without the need for a reload. Besides this, it has the signature Glock Handguns’ texture on top, as well as the MBS system, and the dual recoil spring on the inside. A 10 round capacity variant of this is available for legal purchase, but that simply takes all the fun out of it. Recommended for: sport shooting, gun enthusiasts. Not recommended for: anything else, it’s illegal. 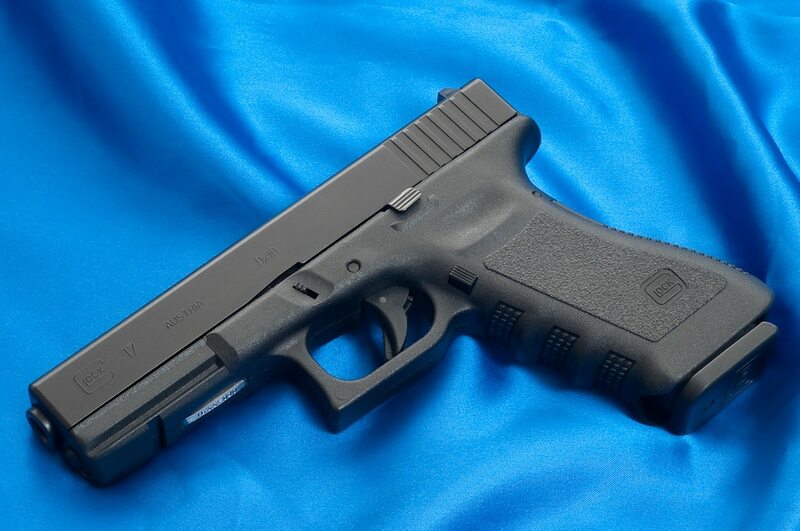 Last but not list in our complete guide to Glock handguns, we thought we’d pay tribute to the Glock 20 Gen 4, a true star of the Glock 10 mm pistols (by the way, we have a bigger article for these over here).This model is, once again, not all that popular. You will not be seeing law enforcement people or military men or women using one of these. But if you happen to come across an amateur hunter, you will more than likely hear high praises raised in the name of this gun. You guessed it – it’s a hunting pistol. Its ease-of-use being unmatched by any other of the Glock handguns, this one is perfect for tight situations while out hunting. If you can aim at longer distances with a handgun, you’ll probably also have no problem using the Glock 20. Like all the previous models we’ve talked about here, this one too features the Modular Back Strap system, the double recoil spring, and the superior dark gray texture on top. Recommended for: gun enthusiasts, hunting. Not recommended for: use by women, law enforcement, first-time gun owners. Glock handguns are the most reliable pistols out there. They’re designed to be taken to all sorts of hostile environments. Drop the Glock in mud, submerse it in water, take it out in the fog, drop sand on it – it will still work (after a proper clean, of course). These guns are built to last. I don’t know about you, but every time I think of choosing something cheap but trustworthy, I think of Glock handguns. Hey Buddy!, I found this information for you: "Glock Handguns Complete Guide". Here is the website link: https://thegunrights.com/glock-handguns-complete-guide/. Thank you.